• Graph Display:Shows measurement trends graphically, with scrolling feature. Record and INSTANTLY display trends for temperature, humidity and dew point with the DVTH. download over 40,000 data points to your PC for further analysis. Data logging has never been this visual! memory used and memory left. Graph Display Shows measurement trends graphically. Graph can be scrolled through the entire logged data. Sample Point Capacity 43,344 points for temperature only. 21,672 points for temperature, humidity and dew point. 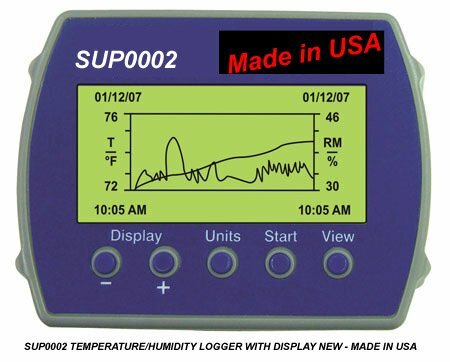 Calibration User single point offset calibration is available through software for both temperature and humidity. Relative Humidity Range 0% to 99%RH, non condensing. 40,000 data points to your PC for further analysis. Data logging has never been this visual! Sampling Interval User selectable from 1 second to 18 hours, in 1 second increments. Data Security Unique factory set logger ID. Recording session counter. Password protected calibration. Operating System Compatibility Windows 98SE, Windows ME, Windows 2000, Windows XP, Vista and above. Not compatible with Windows NT or Windows 95. Minimum System Requirements 5MB of free disk space, 800 x 600 screen resolution, 1 free USB port. Recording Start On button press, immediate after setup, or at a user specified date and time. Real Time Status Visual indication through the status LED. Software real time status. User Calibration Password protected calibration for each channel. Logger Channels User selectable. Disabling channels increases the storage capacity of the other channels. Data Format Exportable to text or Excel files.